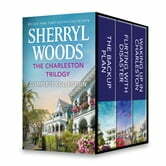 Revisit the beloved Charleston Trilogy with #1 New York Times bestselling author Sherryl Woods in this collection of heartwarming tales. There’s a fine line between desire and disaster. At least, that’s what improper Southern belle Maggie Forsythe thinks when she’s unceremoniously dumped by a fiancé even her mother approved of. Maggie has never cared what anyone thinks, so why is she hiding away from her South Carolina Low Country home? The moment Amanda defied her rich and powerful father to marry Bobby O’Leary, Big Max disowned her. Even now, with Bobby dead and Amanda mired in debt, he refuses to forgive her. Caleb, the new man in Amanda’s life, is determined to mend fences between father and daughter. He also has a far more personal mission—to make Amanda and her family his own. Titles originally published in 2005 and 2006.